Dr. Lázár-Molnár is an assistant professor at the University of Utah School of Medicine. She received her PhD in biological sciences from Semmelweis University in Hungary and completed a postdoctoral fellowship at the Albert Einstein College of Medicine in New York, and a clinical immunology fellowship at the University of Utah. She was the recipient of a Cancer Research Institute postdoctoral fellowship and the 2009 Belfer Outstanding Postdoctoral Research Award, and the Clinical Immunology Society Travel Award to the 2015 Primary Immunodeficiency Diseases Summer School. Her research interests include cellular immunology, immunotherapy, and transplantation immunology. 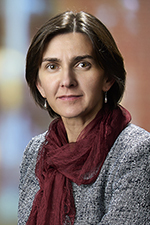 Dr. Lázár-Molnár is board certified by the American Board of Medical Laboratory Immunology (ABMLI) and American Board of Histocompatibility and Immunologenetics (ABHI).